The Royal Queen’s team has designed this new Speedy Chile feminized cannabis seeds to blend the best features of their favorite strains. The fast flowering versions of their cultivars are an ideal alternative to auto-flowering cannabis strains because they have a higher potency and are also designed for shorter flowering periods. The Speedy Chile variety was accomplished by crossing a third-generation auto-flowering plant with a clone, providing you with a feminized cannabis seed that is ideal for indoor or outdoor marijuana gardens. Since some growers have been hesitant to embrace auto-flowering plants due to low THC levels, Royal Queen Seeds designed their new fast cannabis version to yield buds of incredibly high potency. Speedy Chile is a cross between Critical Domina and Chile Indica, and it has an outstanding taste and a relaxing high. Critical Domina is an elite clone that has earned a reputation for producing medical marijuana flowers of the highest quality. The potent Critical Domina is ideal for pain, sleep issues and is a natural appetite enhancer. The Speedy Chile hybrid is 30% sativa and 70% indica, so you can expect the plants to stretch just a little bit and fill out nicely during the flowering period. The blend also provides a high of outstanding quality. The saliva influence can be felt slowly creeping up on you, and Speedy Chile provides an up high that is ideal for those who have tasks to accomplish during the day. The indica also lends a nicely relaxing feel to the finished buds, making Speedy Chile ideal for those who enjoy smoking all day long. Speedy Chile feminized seeds have a fast life cycle, so you can harvest great buds in as little as eight weeks. The quick flowering strain is one of the fastest on the market, and the genetic makeup is ideal for those who want to maximize their growing area with quick turnaround times between crops. Speedy Chile seeds are an excellent choice for indoor or outdoor gardeners, and the plant is perfect for beginners and experts alike. Beginners will appreciate the fact that Speedy Chile requires little care, and experienced growers can dial in their nutrients and work wonders. 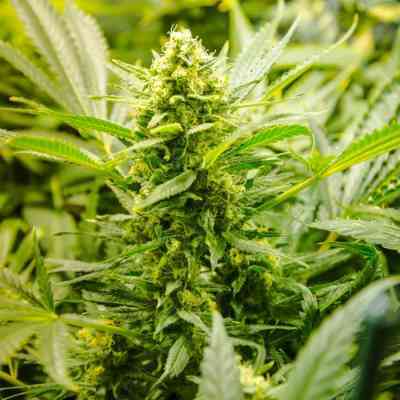 Indoor marijuana gardeners can expect a finished cannabis plant that is short in stature, leaving plenty of room in a grow tent or small closet. The feminized cannabis seeds are engineered for a short flowering cycle, and indoor growers will appreciate the number of harvests that they can receive from their garden. Speedy Chile will finish when it is between 50 and 100cm tall, and the yield is up to 525 grams per square meter. Outdoor gardeners will also appreciate Speedy Chile because the plant will usually be ready for harvest one or two weeks before other strains. Finished buds can be picked in early September, so you can have your product ready before the autumn rains, reducing the chances of mold. Under natural sun, the feminized marijuana plants have an outstanding yield, and growers can expect to harvest up to 500 grams per plant. With an excellent high and outstanding potency, Speedy Chile tests at up to 16% THC, and the finished buds have very little CBD. This custom blend provides for a high that is gently relaxing and incredibly euphoric.